You put your right arm in, your right arm out, in, out, in out, shake it all about. 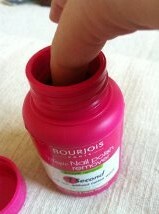 Sometimes taking nail varnish off can be a right pain in the a**. Those deep dark hues might make you go ohhh la la when you first apply, but when it comes to taking them off it's more like damn damn damn. No one wants to arm wrestle their polish off. 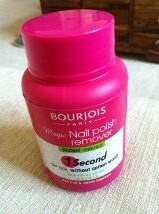 Bourjois Magic Nail polish works some mighty magic on your mitts. Inside the pot is what I am assuming a nail varnish remover soaked sponge. You simply dip each finger into the sponge twist and remove. Your nail varnish has disappeared. The stress is taken out of removing polishes, the pot is small and handy for travel, the smell isn't over whelming so you can remove nail varnish wherever takes your fancy, what else could you ask for? For most nail varnishes you only need one dip and twist, however for those more stubborn glittery little numbers you do need to do a bit more of a jig against the sponge, but still it comes off much more willingly than with your traditional remover and cotton wool fare. Have you experienced the magic yet? What do you think?